MQTT (Message Queuing Telemetry Transport) is an ISO standard (ISO/IEC PRF 20922) publish-subscribe-based messaging protocol. It works on top of the TCP/IP protocol. It is designed for connections with remote locations where a "small code footprint" is required or the network bandwidth is limited. The publish-subscribe messaging pattern requires a message broker. Andy Stanford-Clark of IBM and Arlen Nipper of Cirrus Link authored the first version of the protocol in 1999. In 2013, IBM submitted MQTT v3.1 to the OASIS specification body with a charter that ensured only minor changes to the specification could be accepted. MQTT-SN is a variation of the main protocol aimed at embedded devices on non-TCP/IP networks, such as Zigbee. Historically, the "MQ" in "MQTT" came from the IBM MQ (then 'MQSeries') message queuing product line. However, queuing itself is not required to be supported as a standard feature in all situations. Alternative message-oriented middleware includes the Advanced Message Queuing Protocol (AMQP), Streaming Text Oriented Messaging Protocol (STOMP), the IETF Constrained Application Protocol, XMPP, DDS, OPC UA, and Web Application Messaging Protocol (WAMP). An MQTT system consists of clients communicating with a server, often called a "broker". A client may be either a publisher of information or a subscriber. Each client can connect to the broker. Information is organized in a hierarchy of topics. When a publisher has a new item of data to distribute, it sends a control message with the data to the connected broker. The broker then distributes the information to any clients that have subscribed to that topic. The publisher does not need to have any data on the number or locations of subscribers, and subscribers in turn do not have to be configured with any data about the publishers. If a broker receives a topic for which there are no current subscribers, it will discard the topic unless the publisher indicates that the topic is to be retained. This allows new subscribers to a topic to receive the most current value rather than waiting for the next update from a publisher. When a publishing client first connects to the broker, it can set up a default message to be sent to subscribers if the broker detects that the publishing client has unexpectedly disconnected from the broker. Clients only interact with a broker, but a system may contain several broker servers that exchange data based on their current subscribers' topics. A minimal MQTT control message can be as little as two bytes of data. A control message can carry nearly 256 megabytes of data if needed. There are fourteen defined message types used to connect and disconnect a client from a broker, to publish data, to acknowledge receipt of data, and to supervise the connection between client and server. MQTT relies on the TCP protocol for data transmission. A variant, MQTT-SN, is used over other transports such as UDP or Bluetooth. MQTT sends connection credentials in plain text format and does not include any measures for security or authentication. This can be provided by the underlying TCP transport using measures to protect the integrity of transferred information from interception or duplication. 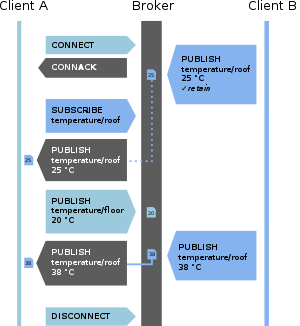 Example of an MQTT connection (QoS 0) with connect, publish/subscribe, and disconnect. The first message from client B is stored due to the retain flag. Waits for a connection to be established with the server and creates a link between the nodes. At most once - the message is sent only once and the client and broker take no additional steps to acknowledge delivery (fire and forget). At least once - the message is re-tried by the sender multiple times until acknowledgement is received (acknowledged delivery). Exactly once - the sender and receiver engage in a two-level handshake to ensure only one copy of the message is received (assured delivery). This field does not affect handling of the underlying TCP data transmissions; it is only used between MQTT senders and receivers. Facebook Messenger. Facebook has used aspects of MQTT in Facebook Messenger for online chat. However, it is unclear how much of MQTT is used or for what. IECC Scalable, DeltaRail's latest version of their IECC Signaling Control System uses MQTT for communications within the various parts of the system and other components of the signaling system. It provides the underlying communications framework for a system that is compliant with the CENELEC standards for safety-critical communications. Amazon Web Services announced Amazon IoT based on MQTT in 2015. The Open Geospatial Consortium SensorThings API standard specification has a MQTT extension in the standard as an additional message protocol binding. It was demonstrated in a US Department of Homeland Security IoT Pilot. The OpenStack Upstream Infrastructure's services are connected by an MQTT unified message bus with Mosquitto as the MQTT broker. Adafruit launched a free MQTT cloud service for IoT experimenters and learners called Adafruit IO in 2015. Microsoft Azure IoT Hub uses MQTT as its main protocol for telemetry messages. XIM, Inc. launched an MQTT client called MQTT Buddy in 2017. It's a MQTT app for Android and iOS, but not F-Droid, users available in English, Russian and Chinese languages. Node-RED supports MQTT with TLS nodes as of version 0.14. Open-source software home automation platform Home Assistant is MQTT enabled and offers four options for MQTT brokers. Pimatic home automation framework for Raspberry Pi and based on Node.js offers MQTT plugin providing full support for MQTT protocol. McAfee OpenDXL is based on MQTT with enhancements to the messaging brokers themselves so that they can intrinsically understand the DXL message format in support of advanced features such as services, request/response (point-to-point) messaging, service fail over, and service zones. ejabberd supports MQTT as of version 19.02. ^ "MQTT 3.1.1 specification". OASIS. December 10, 2015. Retrieved April 25, 2017. ^ "ISO/IEC 20922:2016 Information technology -- Message Queuing Telemetry Transport (MQTT) v3.1.1". iso.org. International Organization for Standardization. June 15, 2016. ^ "10th birthday party". MQTT.org. July 2009. Retrieved April 25, 2015. ^ "OASIS Message Queuing Telemetry Transport (MQTT) Technical Committee". OASIS. Retrieved May 9, 2014. ^ "IBM MQ". IBM. Retrieved November 18, 2013. ^ Piper, Andy (February 19, 2013). "Choosing Your Messaging Protocol: AMQP, MQTT, or STOMP". blogs.vmware.com. VMware Blogs. p. 1. Retrieved October 23, 2013. ^ Shelby, Zach; Hartke, Klaus; Bormann, Carsten (June 26, 2014). "Constrained Application Protocol (CoAP) RFC 7252". tools.ietf.org. IETF. p. 1. Retrieved November 15, 2015. ^ XMPP community (November 1, 2013). "InternetOfThings". wiki.xmpp.org. XMPP wiki. p. 1. Retrieved May 9, 2014. ^ Baker, Fred; Meyer, David (June 21, 2011). "Internet Protocols for the Smart Grid RFC 6272". datatracker.ietf.org. IETF. p. 1. Retrieved May 9, 2014. ^ "DDS Portal – Data Distribution Services". portals.omg.org. Retrieved 2018-01-14. ^ "Microsoft introduces new open-source cross-platform OPC UA support for the industrial Internet of Things - Internet of Things". Internet of Things. 2016-06-23. Retrieved 2017-10-13. ^ "IBM Knowledge Center". www.ibm.com. Retrieved 2018-01-30. ^ Zhang, Lucy (August 12, 2011). "Building Facebook Messenger". facebook.com/Engineering. Facebook. p. 1. Retrieved October 15, 2015. By maintaining an MQTT connection and routing messages through our chat pipeline, we were able to often achieve phone-to-phone delivery in the hundreds of milliseconds, rather than multiple seconds. ^ Wood, Daren; Robson, Dave (August 13, 2012). "Message broker technology for flexible signalling control" (PDF). irse.org. IRSE. p. 7. Retrieved March 31, 2014. ^ Barr, Jeff (October 8, 2015). "AWS IoT - Cloud Services for Connected Devices". aws.amazon.com. Amazon Web Services. p. 1. Retrieved October 21, 2015. ^ "AWS IoT". aws.amazon.com/iot. Amazon Web Services. p. 1. Retrieved July 1, 2017. ^ Brothers, Reginald (January 25, 2016). "S&T's Internet of Things Pilot Demonstrates 'State of the Practical'". dhs.gov. p. 1. Retrieved March 31, 2016. ^ "OpenStack Firehose - The unified message bus for Infra services". docs.openstack.org. OpenStack Infrastructure Team. p. 1. Retrieved August 30, 2016. ^ "Coming Soon: Adafruit IO". blog.adafruit.com. Adafruit Industries. September 16, 2014. p. 1. Retrieved March 29, 2017. ^ "The Internet of Things for Everyone". io.adafruit.com. Adafruit. p. 1. Retrieved July 1, 2017. ^ Dotchkoff, Konstantin; Betts, Dominic; Kshirsagar, Dhanashri; mastermanu; Damaggio, Elio (March 1, 2017). "Understanding Microsoft Azure MQTT Support". docs.microsoft.com. Microsoft. p. 1. Retrieved March 29, 2017. ^ "The story of MQTT Buddy begins!". mqtt.ximxim.com. XIM, Inc. February 24, 2017. p. 1. Retrieved July 1, 2017. ^ "MQTT Buddy". mqtt.ximxim.com. XIM, Inc. Retrieved July 1, 2017. ^ Home Assistant Community (August 7, 2015). "MQTT". home-assistant.io. Home Assistant Community. Retrieved August 4, 2017. ^ Home Assistant Community (August 7, 2015). "MQTT Brokers". home-assistant.io. Home Assistant Community. Retrieved August 4, 2017. The MQTT component needs you to run an MQTT broker for Home Assistant to connect to. There are four options, each with various degrees of ease of setup and privacy. ^ Kail, Marek (October 16, 2016). "pimatic-mqtt". pimatic.org. Oliver Schneider. Retrieved August 11, 2017. ^ "What protocol does OpenDXL use? - OpenDXL". OpenDXL. Retrieved 2017-10-13. ^ McDonald, Ted. "Architecture Guide McAfee Data Exchange Layer (DXL)" (PDF). ^ ProcessOne, Marek Foss (2019-02-26). "ejabberd 19.02: the MQTT Edition". ProcessOne — Blog. Retrieved 2019-03-04. This page was last edited on 1 April 2019, at 20:26 (UTC).